24-7 Limos provide luxury stretch Limo services to London and surrounding areas. All our drivers are CRB/DBS checked and registered. To see all the areas that we cover please select from the menu above to see the services that we offer in your area. Having a fleet of luxury stretch American Lincoln limousines, 24-7limos can cater for every occasion whether you need to arrive to a party in style, wedding or fancy a luxury trip to the airport. 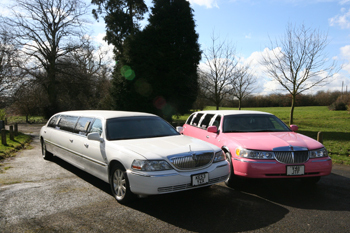 You can choose between our stretch pink limo or white limousine. 24-7 are a private hire registered company with our all drivers and limousines registered with Three Rivers District Council which ensures that all our vehicles are kept to an extremely high standard and that you are in safe hands. 24-7 Limos has been providing quality stretch limos to the Watford and London area for over 10 years and have built up a name you can rely and trust in. We are completely transparent and all our photos are of our own stretch limos and our own customers. We do not use any library pictures on our site or social media – these are our real customers having real fun! We are not brokers. When you book our service you have our 100% guarantee that you will be using our registered drivers and our own quality limousines. If you need a limo for your wedding, corporate event, birthday, airport transfer or party, it would be our pleasure to ensure that you arrive in style, luxury and comfort to begin and end your night in the perfect way.